Springer Handbook of Enzymes provides data on enzymes sufficiently well characterized. It offers concise and complete descriptions of some 5,000 enzymes and their application areas. Data sheets are arranged in their EC-Number sequence and the volumes themselves are arranged according to enzyme classes. This new, second edition reflects considerable progress in enzymology: many enzymes are newly classified or reclassified. Each entry is correlated with references and one or more source organisms. New datafields are created: application and engineering (for the properties of enzymes where the sequence has been changed). The total amount of material contained in the Handbook has more than doubled so that the complete second edition consists of 39 volumes as well as a Synonym Index. In addition, starting in 2009, all newly classified enzymes are treated in Supplement Volumes. 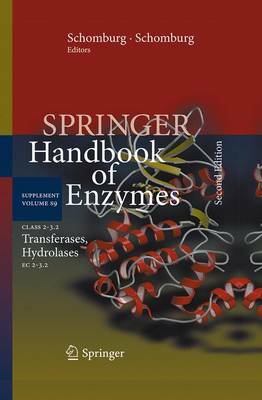 Springer Handbook of Enzymes is an ideal source of information for researchers in biochemistry, biotechnology, organic and analytical chemistry, and food sciences, as well as for medicinal applications.